WASHINGTON—Standing uncharacteristically firm as the partial government shutdown stretched into the 25th day, Senate Minority Leader Chuck Schumer admitted Tuesday that he was honestly pretty amazed he hadn’t caved yet. “Realistically, I thought I’d make it five days max before rolling over and giving them whatever they wanted,” said Schumer (D-NY), adding that despite lengthy negotiations with Republican lawmakers, he had oddly been unable to find the right moment to raise a white flag in the spirit of token bipartisanship. “It’s weird because giving up is just sort of what I do. I mean, the thought of folding has certainly crossed my mind, but for whatever reason, I still haven’t picked up the phone and demanded Democrats vote for a bill that funds the wall, or cuts Social Security, or concedes anything else McConnell might want. Frankly, I don’t know what the hell is wrong with me—maybe I’m getting sick? Normally I back down right away. 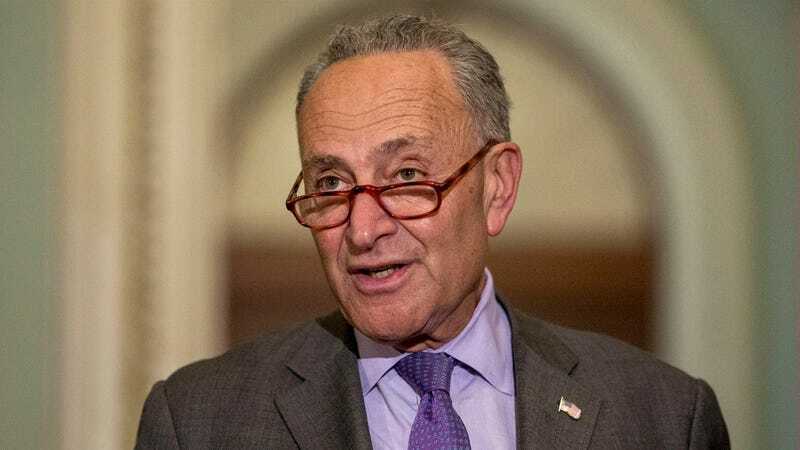 I’ve built my whole career on it.” At press time, Schumer urged Republican lawmakers to “do their job” and give him something, anything so that he could just surrender and move on.